She said making a house and role debut in San Diego caused 'some nervousness coming in. You know Stephen has done his role many times, and this is my first time. In an hour's conversation with Jordheim at San Diego Opera's Civic Center rehearsal room I found she had an extraordinary diversity of activities and interests that extended to repertoire, operatic composers, teaching, travel, and even pop music. 'I love having an eclectic mix of things in my life in all areas.' On the way to a Doctor of Musical Arts degree in Voice Performance at CCM she became a State-Tested Nursing Assistant in Ohio. In her home state of Wisconsin she worked as a physician's record-assistant in the emergency room at Appleton Medical Center. Piazzolla is a special case. Her mother and father are musicians and professors at Lawrence University where she studied for two years before transferring to CCM. Her father introduced her to the tango composer, and she sang his music in arrangements that included dad's saxophone. Jordheim began voice training when she was ten, not necessarily a good age because the voice can be damaged if not used correctly, and it changes at puberty. She credits her coach for taking that into consideration. 'My teacher Patrice Michaels was wonderful. She was masterful at introducing me to material that was appropriate. I started singing musical theater repertoire in a conservative range with nothing terribly high. I think my first aria was Barbarina's, and that was my first introduction to opera.' She's now sung in The Marriage of Figaro three times. This is a brief clip from one of her performances as Barbarina. Jordheim also credits Michaels for introducing her to vocal technique, styles, languages and the International Phonetic Alphabet (IPA), the tool used to transliterate opera librettos into a form that helps singers with the accent and diction a composer had in mind, a skill necessary for correct musical phrasing. The early introduction to IPA influenced her subsequent degree track. As a Fulbright Scholar and Fellow of the American-Scandinavian Foundation, while earning her Doctor of Musical Arts she studied and conducted research on singing diction in the Scandinavian languages at the University of Oslo. 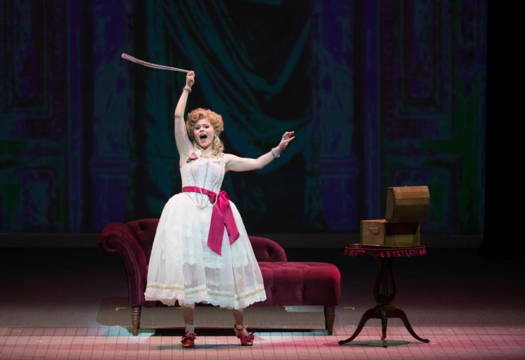 Jordheim's performance as Cunégonde in Palm Beach Opera's production of Candide produced one of the most satisfying moments so far in her budding young career. 'Glitter and Be Gay' is a key aria. 'It's fun and terrifying at the same time, especially with props to worry about. I thought I'd done pretty well, but I'm never totally satisfied. Maybe this note could have been a little brighter. But the applause just kept happening.' In this clip she sings the same aria in a concert setting. A prodigious appetite for repertoire extends to contemporary composers. She's recorded Fresh Patterns, a song cycle written for her by Lori Laitman and also premiered works composed for her by Douglas Pew, Joanne Metcalf, Josh Deutsch, and Rodney Rogers. She sang Lola in the world premiere and commercial recording of Sister Carrie, written by Grammy award-winning composer Robert Aldridge and librettist Herschel Garfein. Jordheim has been relying on Guy Barzilay Artists in New York for bookings and career advice for nearly five years years, and recently moved to New York because she'd been traveling there so often for auditions. 'They really have good ideas about repertoire and career trajectory for me. Repertoire is so important. It shows what you can do and what you can't.' And as the voice changes over time, repertoire changes. 'I used to feel super comfy hanging out in the stratosphere for a long period of time, and now, while I still enjoy hanging out up there. I really love singing low notes. I find that I get a little more richness in the low and middle-range and that's exciting.' It expands the number of roles she can take on. 'I hope to be able to sing anything.' When I jokingly asked if she envisioned a progression from page to Gilda to the baritone lead in Rigoletto, she laughingly admitted there were limits. Later this year Jordheim will be an artist-in-residence at Temple University, standing in for a friend while she's on maternity leave. And amidst teaching and coaching she'll be singing Ninetta in The thieving Magpie by Rossini. A Merry Widow is also in the works. I'm looking forward to seeing her as Gilda next weekend. Alisa Jordheim sings Gilda in Verdi's Rigoletto at San Diego Opera on Saturday 2 February, Tuesday 5 February and Friday 8 February 2019, all at 7pm, and also on Sunday 10 February 2019 at 2pm. For ticket information visit the San Diego Opera website. Ron Bierman's feature interview with Alisa Jordheim was first published on the broadwayworld.com website.